The idea of cycling from Prague to Vienna was a maturation of a previous plan to ride along the shores of the Danube from Vienna to Budapest . In 1998, while on a cycling trip through Mexico, Kevin Rodger and five colleagues from work met a Austrian tourist at a resort called Rancho Encantado. He told us of the Danube Cycle Path. We all thought it was a good idea, and we formulated plans to go. Unfortunately, the airline we were to take to Europe ended up on strike, and our plans had to be changed. Through the years, some of the “gang” got married, had kids, or developed relationships. Plans were put on hold. After several years, the plan resurfaced after Kevin kept on hearing about this magnificent European bike path. After researching several web sites, he came upon the Czech Greenway – a signed bike path all the way from Prague to Vienna . To quote the website, “The The Prague-Vienna Greenways is a 250 mile long network of hiking and biking trails between Prague and Vienna . Travelers can walk or bike between historic towns and villages, visit romantic castles, medieval churches and monasteries, discover old Jewish sites and savor some of the most picturesque countryside in Europe . The routes stretch along the Vltava River Valley in Southern Bohemia and the Dyje River Valley in Southern Moravia , the settings of numerous folk and music festivals.” Four hundred kilometres – this was a nice, doable distance that would allow ample time for sightseeing. During research, the world heritage site, Cesky Krumlov kept coming up. This well preserved medieval town was entered into our itinerary, and added a few extra kilometres in the process. 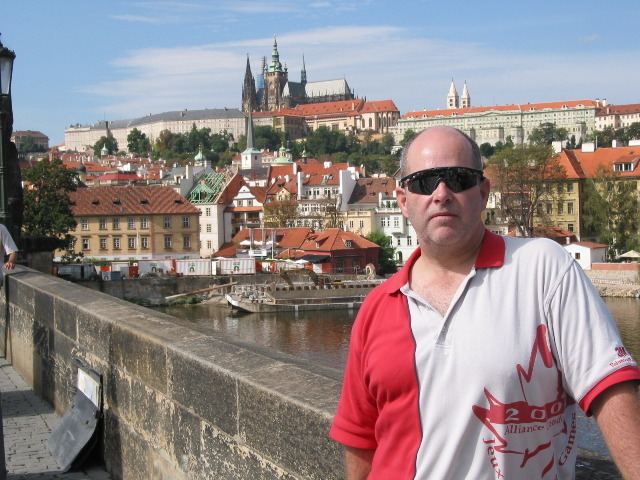 Prior to our departure from Canada , we used a 1:400,000 scale Michelin road map to do most of our planning, and intended to buy all of our detailed cycle maps upon arrival in Prague . This turned out to be a bit of a mistake. Not only were our planned distances grossly in error (by about 50%), owing to the fact that many of the bike paths meander (bike paths are not indicated on the road maps) – some of the maps were not available at the bookstore. I would highly recommend obtaining the cycle maps before you go. This will allow you to do better planning, and eliminates the planning one normally does at night after just having cycled 100 km. Don’t try to skimp, either – we didn’t get the close by adjacent maps, thinking we could get by without 15 km or so that were on the adjacent maps. These would have been invaluable after several small detours took us off the maps altogether. But then, that’s part of the fun of planning the route yourself. And the fact that we are now back in Canada is testament to our great navigation skills (ha)! There is a link to the maps from the "Friends of the Greenways" web site. We never had a problem finding accommodations along any portion of our route our route. Most of the small towns had reasonably priced pensions, zimmer freis, or small hotels. Some small towns have only one hotel or pension, and we did run into one that was full. However, it is generally not far to the next town. 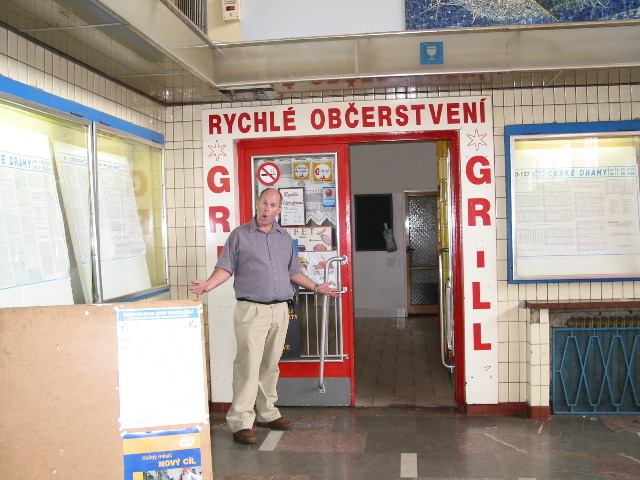 In some areas of the Czech Republic , it was difficult to find convenient places to eat lunch. I would recommend taking snacks along in case you can’t find a lunch stop. Take at least two water bottles with you, and don’t neglect to fill them up when the opportunity arises. Our trip actually started in Frankfurt , where our plane arrived from Toronto. We decided to take a train from the airport to Prague, as we thought it would be nice to see the countryside close up, instead of from 29,000 feet from inside a plane. 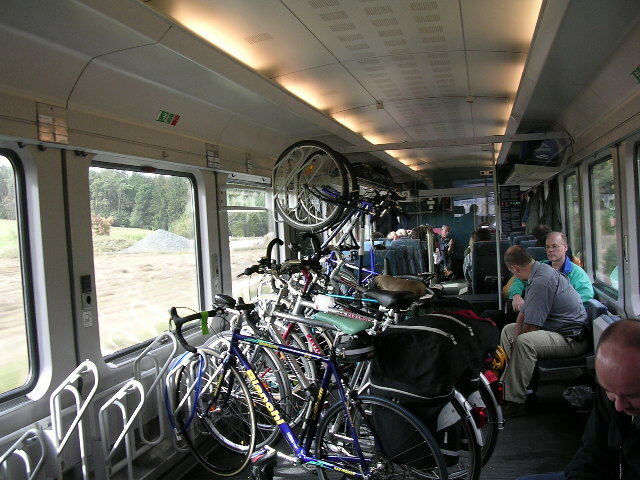 We did not make reservations in advance because we could not book bicycles on the Deutsches Bahn web site. We did not think this would be a problem in what we considered the off peak season. “Eeet eees not possible,” the ticket clerk advised us. We pleaded with him, explaining we would have done so, but the web site did not allow it. We even showed the printout from the web site. After making about ten phone calls, he replied, “Eees now possible”. We boarded our train twenty minutes later. This train had two dedicated cars strictly for bikes. Trains that take bicycles had the profile of a bike painted outside the applicable car. The front car, where we put our bikes was filled almost to capacity with bikes, panniers, and various cycling paraphernalia. We could see why reservations were essential. The bikes were hooked into specialized carriers that hooked onto the front wheel. Panniers could be left on the bikes, and no tiedowns were required. The first train went as far as Nuremberg , where we had only 26 minutes to change trains. We were a bit worried about this short connection time, but in usual German efficiency, this connection went without a hitch. The next train, a Regional Express took us as far as Marktredwitz, a German town close to the Czech border. As we had almost an hour before our next train left, we decided to have a quick bowl of soup at a café just across the street from the train station. Quick is not the operative word here. By the time our food arrived, we barely had five minutes to scarf it down. Train number 3 was a very small privately run train consisting of two cars. It would take us the short journey across the border to Cheb. We simply stood our bikes up against the wall of the train. It was a good thing the train was not crowded. Part way along the Czech border patrol asked us for our documentation. As they were training a new guard (we assumed), they had a lot of fun with the unfamiliar Canadian passports. Duly stamped by an illegible rubber stamp, we were now in a “foreign” land. In Cheb, we could clearly see the communist influence. Everything seemed very plain, and a bit on the drab side. We wondered what kind of train we would be boarding next, as several old and dilapidated models were on display at the train station, and very similar drab green trains made their way along the tracks, pulled by equally dilapidated engines. In Cheb, we would spend almost two hours before our train left for Prague. We decided to venture into the town square and get something to eat. It was already 3:30 p.m. , and we had been on the road just over 21 hours since leaving our hometown of London, Ontario . In the square, we ventured into a nice restaurant that had outside seating. We ordered a meal and our first beer (of many) on this trip. After finishing our lunch, Paul asked for the “bill”. After the waiter left, I told Paul he shouldn’t have done that, as the pilsner style of beer is quite often abbreviated to “pils” in the Czech Republic, and I wasn’t so sure the waiter understood him. Sure enough, the waiter soon arrived with three more beers. Thankfully, he took them all back (we didn’t have time to drink them). We thanked him profusely, and tipped him accordingly. After arriving at the train station, we went to find our platform to wait for the train. The man at the information booth could not speak English, but he offered his services in several others: Czech, German, Russian, or Polish. Tom got what he thought was the correct information. After arriving at the platform, a worker directed us to another platform. 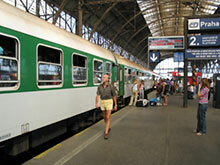 When the train arrived, it seemed to be going in the wrong direction – back towards Germany . After prodding the worker and trying to say “Prague” in Czech (Praha), and German (Praga), he redirected us to the appropriate platform. An old green soviet monolith of a train soon arrived. We had to hoist our bikes about three feet above us to get them on the train. There was limited space for the bikes, and no tiedowns available, so we simply left them in an open space between cars, where the boarding doors were. At every stop (and there were a lot of them), one of us had to get up to make sure the bikes were not in anyone’s way. Paul found the toilet on this train especially intriguing – it had a simple flap that when opened delivered its “package” directly to the ground below. The flapper on this train was not operating properly, and stayed open after being flushed. Paul discovered that paper articles dropped down the hole found themselves being blown back into the train. This could be embarrassing depending on what you threw down. 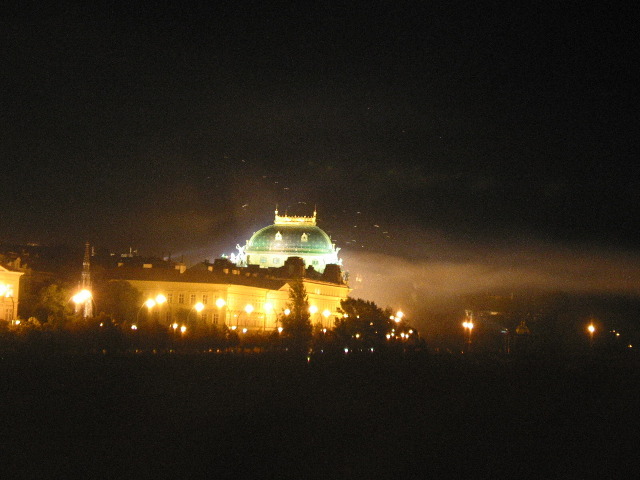 Arriving at Prague’s busy Hlavni nadrazi train station (it even had a casino) at 8:45 p.m., we slowly made our way to the Charles Bridge, and ultimately our hotel close to the castle. We walked most of the way, as it was now dark, it was hard to ride on cobblestones, and we were more or less bewildered by this beautiful city. The next day, we skipped the breakfast at the hotel, as it would not be served until after 9:00 a.m., and with the limited amount of time available to us, we wanted to take in as many sights as possible. We found a restaurant offering breakfast, and without even looking at the menu, we ordered what proved to be a very expensive full "American" breakfast. 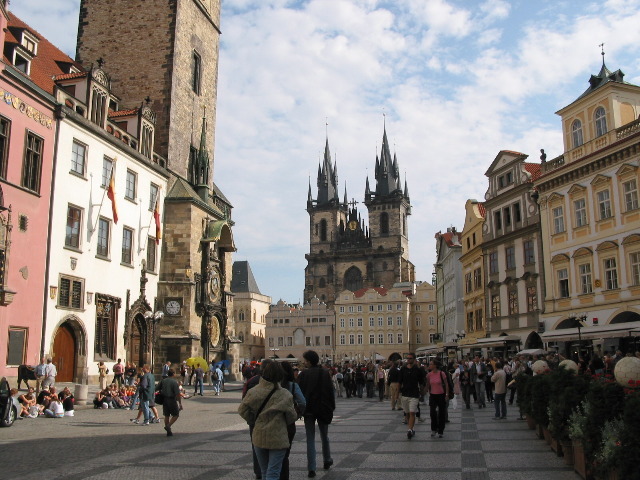 Afterwards, we hastily ran around the small central core area of Prague, including the Stare Mesto (old town) and the Hrad (castle) in our itinerary. 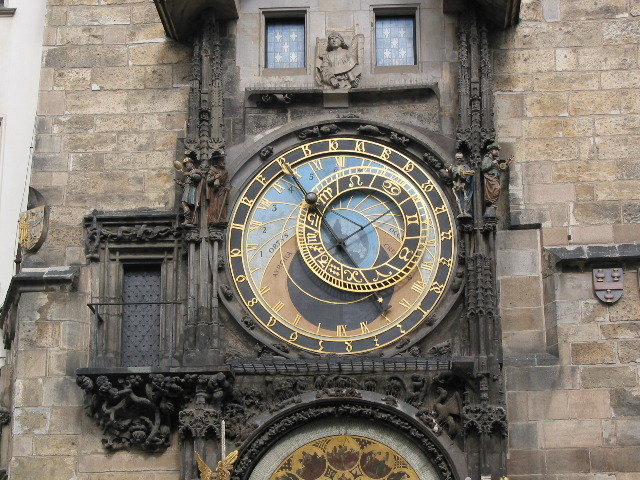 I especially found the famous astonomical clock at the Old Town Hall to be especially interesting. Unfortunately, we did not have the time to wait until the top of the hour, when the clock features a procession of figurines representing the 12 apostles, preceded by the figure of Death (you can see him in the picture below to the right side of the clock) pulling a rope in his right hand, and inverting an hour glass found in his right hand. 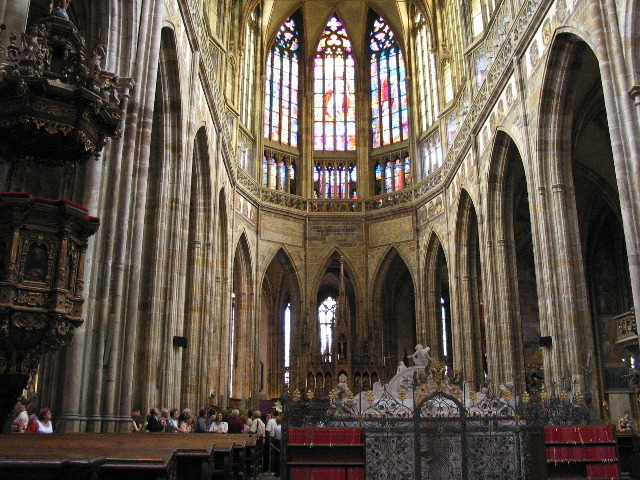 We did have time to pick up a few souvenirs, as well as some detailed cycling maps, and during the evening, we took in a concert featuring Mozart, Vivaldi, and local Czech composers at the baroque Church of St. James. The concert included more renditions of Ave Maria than I even knew existed. 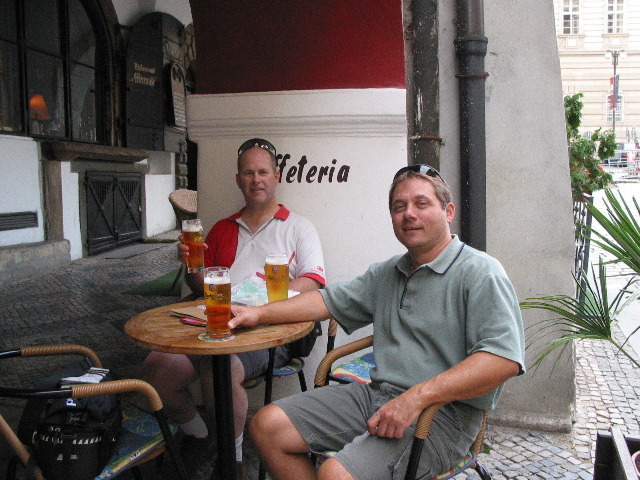 After touring around Prague for the day, we had a few beers, and retired to our hotel where we hastily planned our next day's adventure.